From the depths of Arkham, her high-pitched laughter echoes along the cold, concrete walls. 'Mista J!' bounds through the halls and illustrator Hainanu 'Nooligan' Saulque followed and found HARLEY QUINN. He brought her to the asylum at DC Collectibles and we took the buckles off the straightjacket and released her to the world.But he's not the only one. An army of some of the sickest artists in the industry has been summoned and they have answered the call. 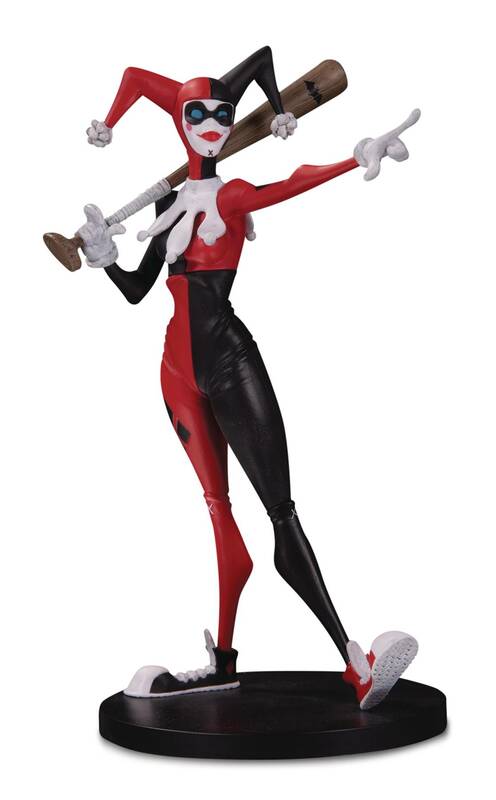 With each new wave of PVC statues comes a brand-new artist and an all-new style, building unreal interpretations of DC's iconic heroes and villains. This is DC like you've never imagined…but they have. Are you ready for DC Collectibles Artists Alley? Playing up artist Hainanu 'Nooligan' Saulque's contemporary style with a flare of nostalgia comes Harley Quinn. Drawing inspiration on the characters quirky accent and paying homage to one of the most recognizable moments in American sports history comes a Harley you don't want to miss DC Artists Alley is a graphic and stylized PVC collector statue line from DC Collectibles based on designs from today's cutting edge artists. Channeling the popular comic convention experience, DC Artists Alley brings unique, artistic viewpoints to the DCU through highly-detailed, limited edition designer vinyl and includes a print featuring the original artwork the figure is based on..